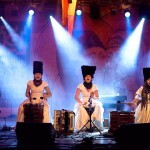 DakhaBrakha is world music quartet from Kiev, Ukraine. 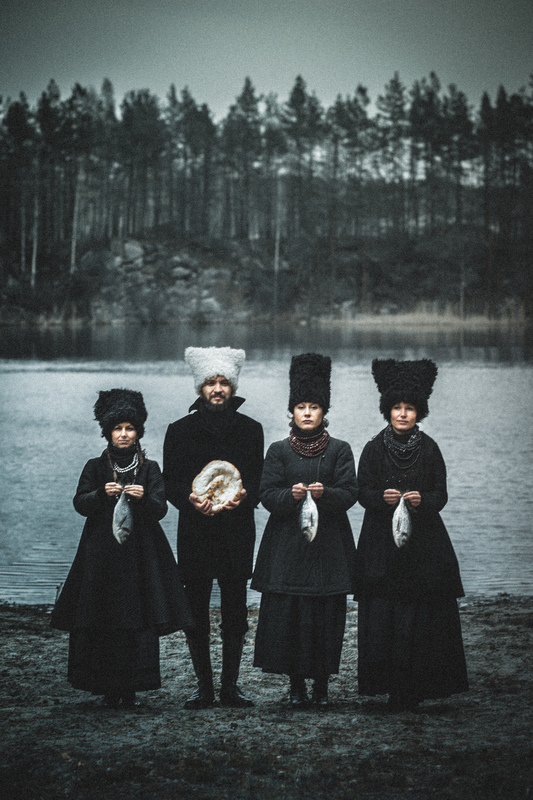 Reflecting fundamental elements of sound and soul, Ukrainian “ethno-chaos” band DakhaBrakha, create a world of unexpected new music. 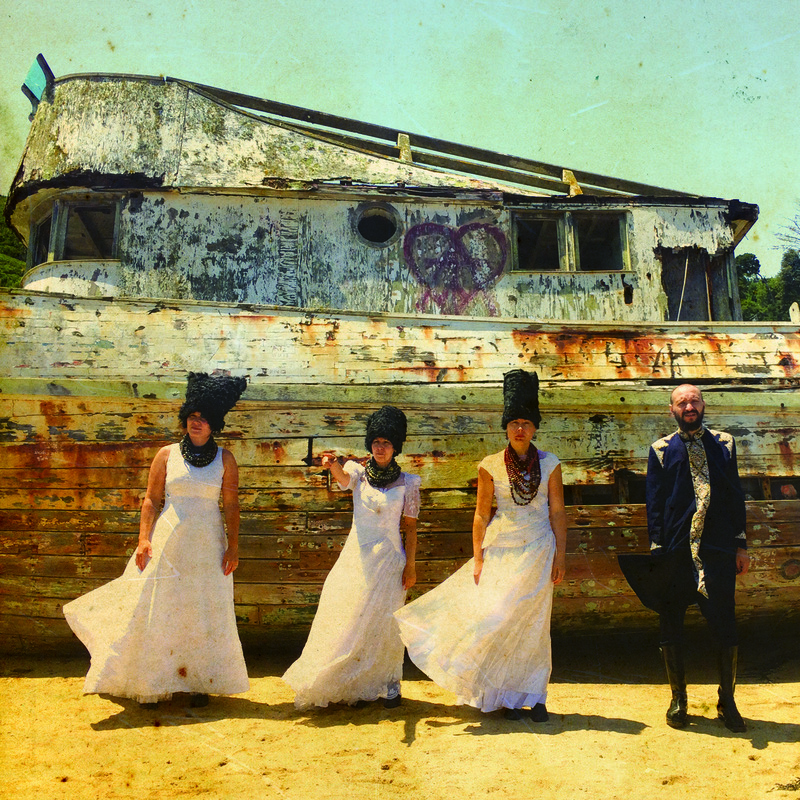 The name DakhaBrakha is original, outstanding and authentic at the same time. It means “give/take” in the old Ukrainian language. Accompanied by Indian, Arabic, African, Russian and Australian traditional instrumentation, the quartet’s astonishingly powerful and uncompromising vocal range creates a trans-national sound rooted in Ukrainian culture. 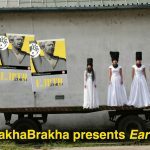 Live Soundtrack for “Earth”: In addition to their own performances, DakhaBrakha also performs their original live soundtrack alongside a screening of the classic 1930 film, “Earth”, by Aleksandr Dovzhenko (considered to be one of the most important films of the Soviet era). Dovzhenko is a master of composition, and the film—with its intense close-ups and the impressive expanses of the landscape—is a passionate tribute to the countryside, to nature, and to the people that work on it. 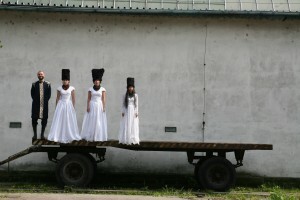 DakhaBrakha is music quartet from Kiev, Ukraine. 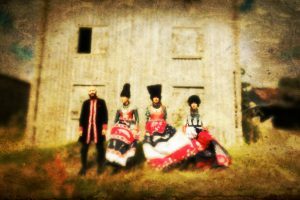 Reflecting fundamental elements of sound and soul, Ukrainian “ethno chaos” band DakhaBrakha creates a world of unexpected new music. 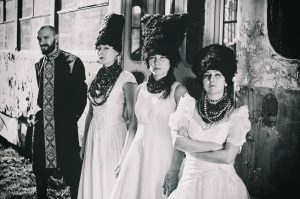 DakhaBrakha was created in 2004 at the Kyiv Center of Contemporary Art “DAKH” by the avant-garde theatre director – Vladyslav Troitskyi – and given the name that means “give/take” in the old Ukrainian language. Theatre work has left its mark on the band performances – their shows are always staged with a strong visual element. After experimenting with Ukrainian folk music, the band has added rhythms of the surrounding world into their music, thus creating the bright, unique and unforgettable sound of DakhaBrakha. They strive to help open up the potential of Ukrainian melodies and to bring it to the hearts and consciousness of the younger generation in Ukraine and the rest of the world as well. Accompanied by Indian, Arabic, African, Russian and Australian traditional instrumentation, the quartet’s astonishingly powerful and uncompromising vocal range creates a trans-national sound rooted in Ukrainian culture. At the crossroads of Ukrainian folklore and theatre, their musical spectrum is at first intimate then riotous, plumbing the depths of contemporary roots and rhythms, inspiring “cultural and artistic liberation”. In March 2010, DakhaBrakha won the prestigious Grand Prix prize named after S.Kuriokhin, in the sphere of contemporary art, and confirmed its place in the culture once again. In March 2011 DakhaBrakha was discovered by Australian Womadelaide and began their ascent in the international music scene. They have since played more than 300 concerts and performances and have taken part in major international festivals throughout Eastern and Western Europe, Russia, Asia, Australia, and North America. DakhaBrakha has also collaborated with such international musicians as: Port Mone (By), Kimmo Pohjonen Cluster (Fi), Karl Frierson (DePhazz) (Ge), Steve Cooney (IRL), Inna Zhelannaya (Ru), Kievbass (UA), Djam (UA-Iran), and David Ingibaryan (Hu). 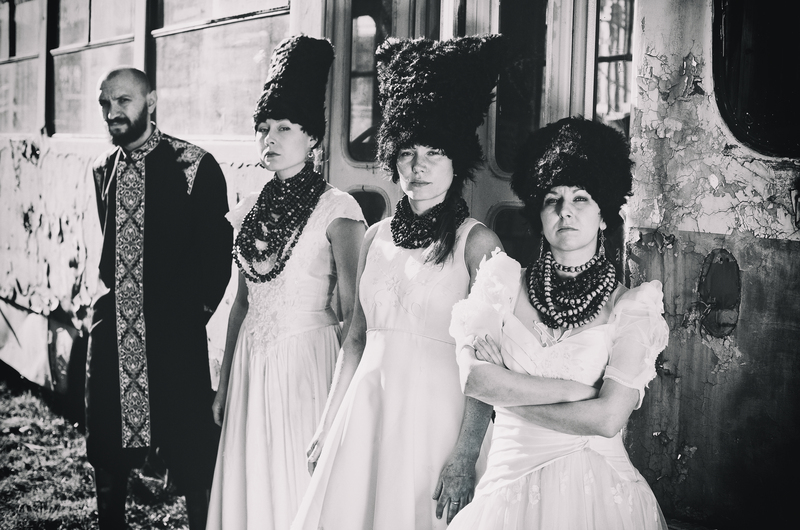 In addition to their own performances, DakhaBrakha also performs their original live soundtrack along with screening of the classic 1930 film, “Earth”, by Aleksandr Dovzhenko, considered to be one of the most important films of the Soviet era. Dovzhenko is a master of composition, and the film—with its intense close-ups and the impressive expanses of the landscape—is a passionate tribute to the countryside, to nature, and to the people that work on it. “Earth” was banned 9 days after it’s original release, and was glorified in Ukraine only after Dovzhenko’s death in 1956. Full of lyrical pantheism and utopian exaltation, it demonstrated the ambiguity of Ukrainian geopolitical choice in the 1920s. In 1958, a film critics’ forum in Brussels named “Earth” one of the 12 best films in the history of world cinema. Marko is the only representative of the countryside in the band. He was born in the village of Krushenivka, in the Vinnitskiy region. into a family of village intellectuals. He graduated from the faculty of the Ukrainian philology, but came into the theatre, became an actor of the Centre of Contemporary Art “DAKH” and then accidentally found himself working with the band. 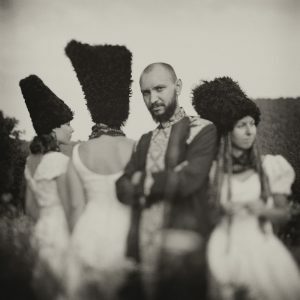 Marko is fond of design – he creates the visual images of DakhaBrakha and also for the “DAKH” theatre where he continues to perform on stage as an actor. Ira has played Ukrainian ethnic music since her early childhood. Moreover, she has graduated from the faculty of folklore. She is fond of yoga, yachting, and rowing. Ira is responsible for the “brass section” of the group, as she easily gets the feel of different musical instruments. She also performs at the “Dakh” theatre as an actress. Lena is one of the specialists at the folklore department of the National University of Ukraine. When she has some time off, she works on preparing her Candidate’s dissertation about traditional Ukrainian wedding songs. She is fond of driving, sewing and interior design. Nina professionally studied folklore and is a self-taught cellist. She is the most artistically open-minded member of the band and is always up for collaborating with other musicians. Nina is fond of travelling, photography, fancywork and adornment creation. The quartet does far more than introduce Ukrainian music or prove it is alive and well. 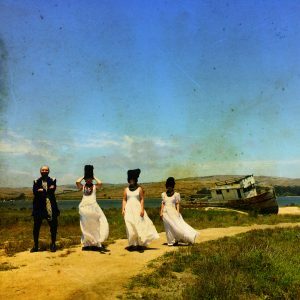 They craft stunning new sonic worlds for traditional songs, reinventing their heritage with a keen ear for contemporary resonances. 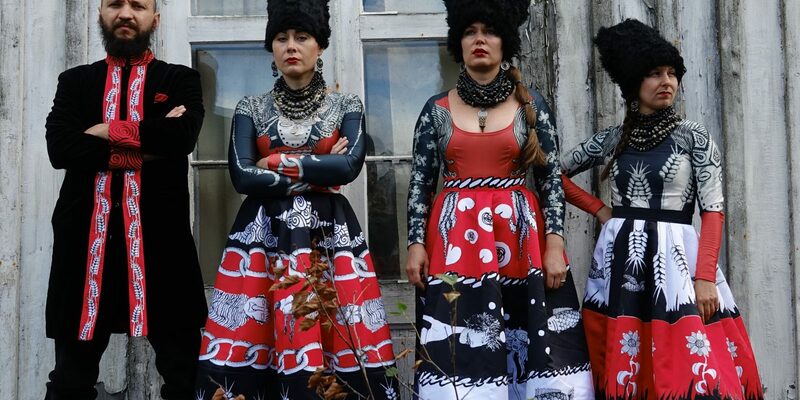 With one foot in the urban avant-garde theater scene and one foot in the village life that nurtured and protected Ukraine’s cultural wealth, DakhaBrakha shows the full fury and sensuality of some of Eastern Europe’s most breathtaking folklore. Reno, NV USA UNR music students, in performance hall. DakhaBrakha featured on PRI’s “The World” Marco Werman and Allison Herrera recently discussed a DakhaBrakha concert at the Dakota Jazz Club in Minneapolis on their summer tour of the USA. 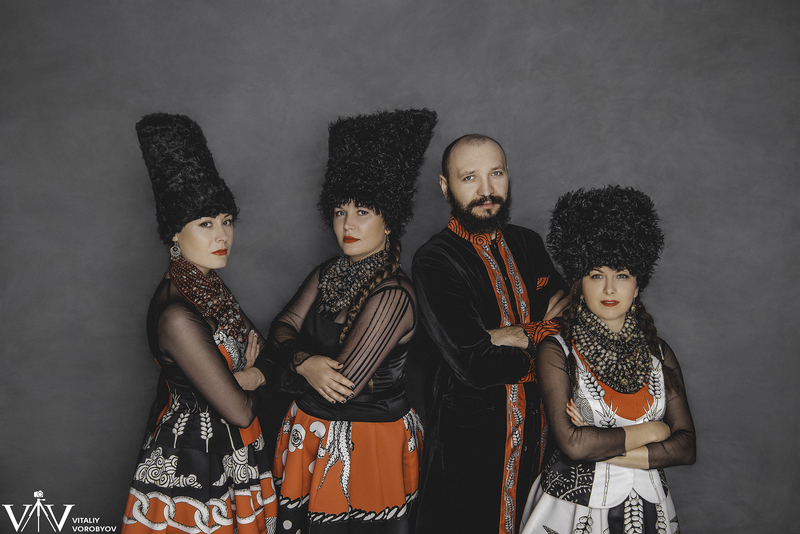 “When you go to hear the Ukrainian band, DakhaBrakha, the first thing you notice is their outfits. Since that’s where I am at the moment. It is, by the way, a surprisingly handsome city. Just looking at the city center you’d have no idea how much stress Ukraine is under. 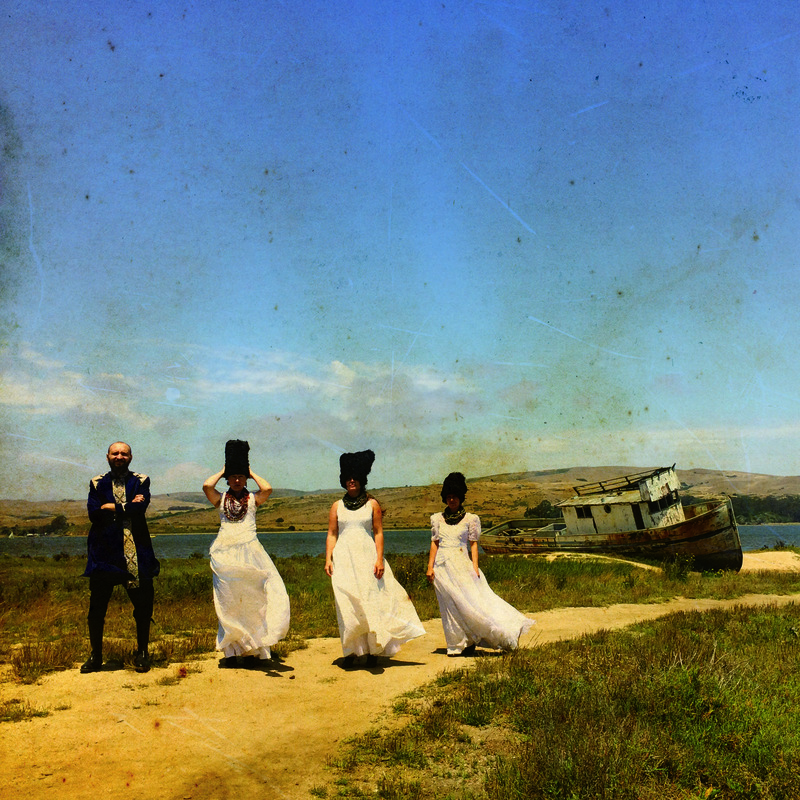 Love from NPR: DakhaBrakha plays one of Bob Boilen’s top-10 shows of 2015 Despite writing a book, NPR’s Bob Boilen managed to see 506 bands take the stage in 2015. 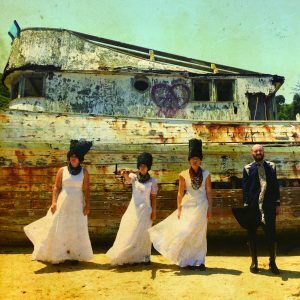 Among his top-10 favorites are DakhaBrakha—the only world music band to make his coveted list! KQED Arts article on DakhaBrakha’s soundtrack for the Soviet-era Ukrainian film classic, “Earth”. “They earned rave reviews– everyone was in awe. They are such talented and creative artists. We would like to bring them back anytime.